Love kids? Want to own your own business? Make your own hours? Be financially independent? Teach Swim-Float-Swim to Infants and Toddlers by getting your Baby Swimming Instructors Certification. Learn the superior exciting way to teach infants and toddlers to swim and float for safety and fun. Swim-Float-Swim is sweeping the nation. Every child should have these survival skills. PediaSwim Instructors teach children to swim in the most hydro-dynamic posture allowing the child to move quickly through the water, roll to a confident, secure float for an easy breath, and then flip over to swim to safety. Now you can learn to teach these amazing skills in the safest, most effective program available. Become the swimming professional in your community. How should you choose an infant survival swimming training program? There are many programs and instructors around the country who say that they offer training. Do your due diligence. Your training is too important to make that decision lightly. Visit the instructor where you are considering training. Get in the water with that person. Spend a few hours. Get comfortable. Make sure that you see lots of children exhibiting the skills you want to learn to teach. You will know it when it is right. 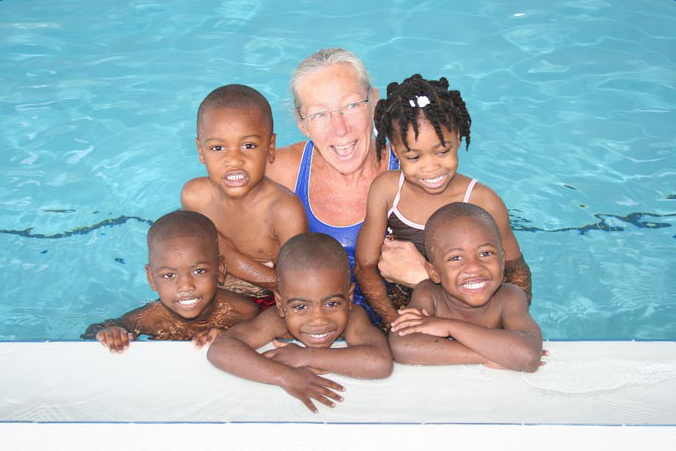 Why train with Joy McGinty at SouthWest Aquatics? SouthWest Aquatics offers year-round training in a toasty 90 degree, indoor commercial pool. With seven very busy PediaSwim Instructors, you will be working with lots of children from infants learning to roll to a float, to toddlers learning to swim-float-swim. As a bonus, you are welcome to work with our Stroke Instructors, to learn how PediaSwim progresses to amazing stroke progression in very young children. You will learn how our incredible SouthWest Stars USA Swim Team, has evolved from our Learn to Swim Program. Make sure you will get the best training available before you spend your time and money. Click here to search for successful instructors trained at SouthWest Aquatics. I did my training with Joy at SW Aquatics. I love everyone there. So proud to tell people about them. Thank you Joy for changing so many children’s lives for the better. You make a huge difference in so many lives you can’t even imagine!